better than i could have imagined: Happy Birthday Momma ! ! ! ! ! ! Happy Birthday Momma ! ! ! ! ! ! Today is Marla's Birthday. In honor of this wonderful day I decided to do a post. I more so decided to do this because she didn't want anything for her birthday...but I couldn't just sit here and do nothing!! 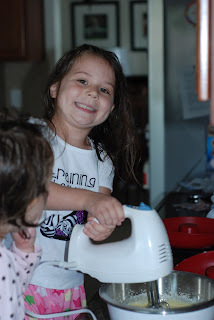 We decided to bake mommy a Happy Birthday donut cake!! The girls were very excited!! I let them put in all of the ingredients and then they took turns mixing all of them..
As you can see, Grace can't seem to keep her hands out of the batter. 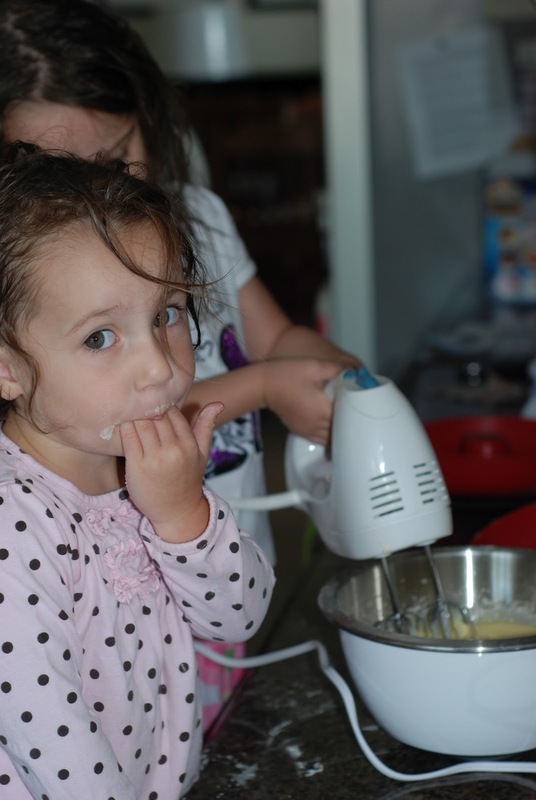 Of course both girls had to lick the batter when we were done!! These molds are pretty cool. They're made of silicon. We used the extra attachment mold to make a reservoir to hold nothing but chocolate. I then made them a special 4th of July lunch mainly because Marla gets a kick outta that kinda stuff. She is the creative one in the family, but me...I just cut off the crust. 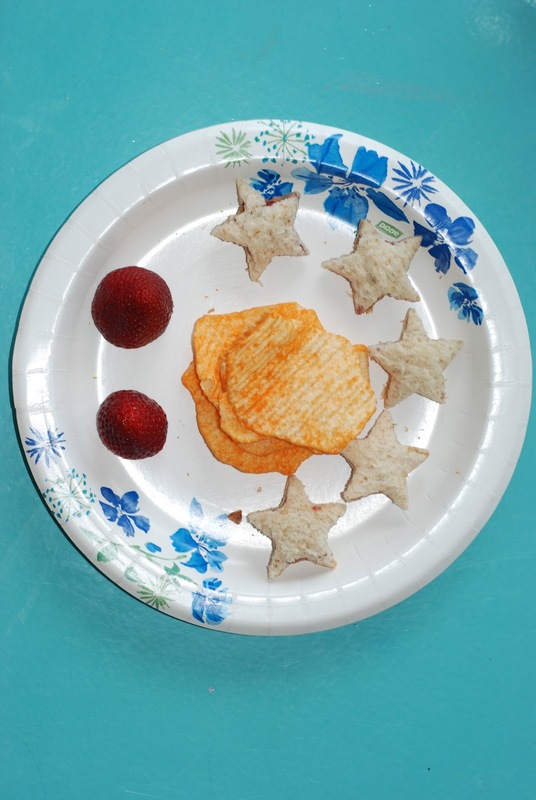 The peanut butter sandwich was cut using little star shapes. Once the cake cooked, we took it out, filled up the chocolate (sorry but I didn't get a picture of that. Just picture a cream filled donut in your head and that is what's pictured below). All I did for the frosting was heat it up in the microwave so it was nice and runny and then poured it on. Again, Grace had to have a lick. I know Marla won't care to much for this part, but I let them eat a lot of the leftover chocolate. Sorry mom, but it's your birthday and they wanted to celebrate early!! Happy birthday momma, we love you so very much and we thank you for all that you do for us!!!! Happy Birthday! Great job on the post it looks great, I am sure she will love it! Happy Birthday Marla! Good job Geoff!! That donut looked amazing!!! I know the girls enjoyed that! 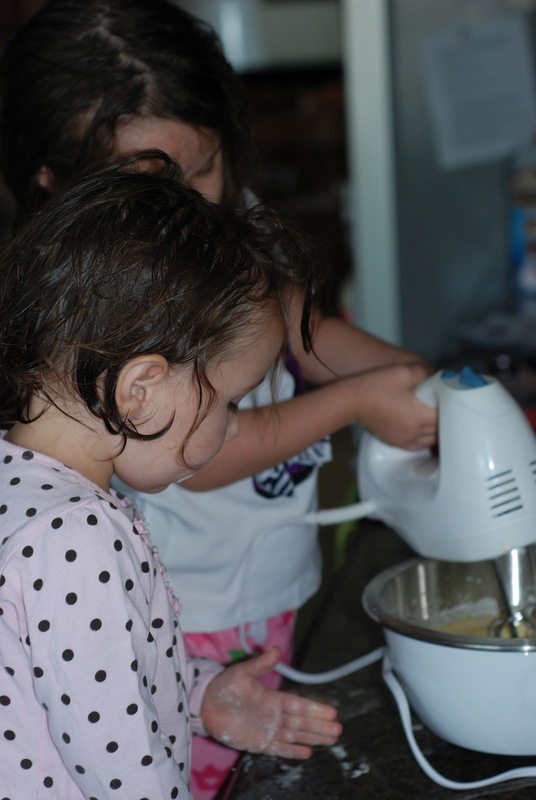 Marla- you are truly lucky to have a husband like Geoff to do these blog posts! I would love if Phil did these things!! So cool!!! Grace @ 2 and a half.